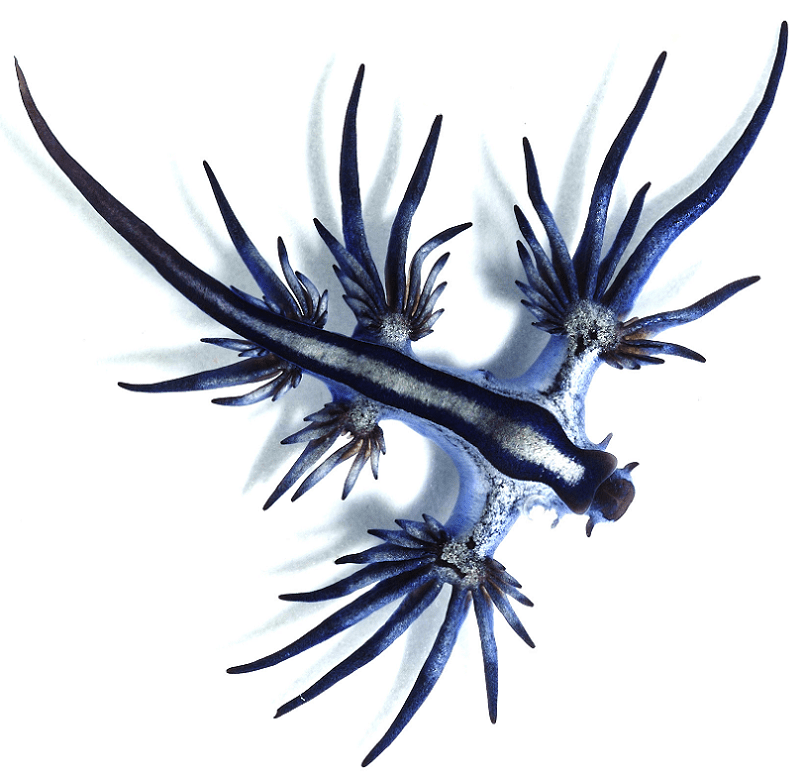 The Sea Swallow represents a small variety of sea slug and a pelagic nudibranch. It typically preys upon other pelagic creatures which include the highly toxic cnidarian known as the Portuguese Man O War. It has this ability because it evolved an immunity to the venom. This amazing creature actually stores the venom in its own body and then uses it for its own defense. In this manner, though it itself does not develop toxins, it remains capable of delivering a painful sting. The remarkable Sea Swallow remains rather small, with a mature adult only attaining a length of about 1.2 in (3 cm). This sea creature typically shows a silvery gray on one side, and pale blue on the other. Its brilliant blue coloring is not just for show, it also provides it with excellent camouflage. Interestingly, at least scientifically, all members of this species develop as hermaphrodites, having both male and female reproductive organs. The Sea Swallow remains primarily a pelagic species and lives in most oceans, including temperate and tropical. The areas of greatest concentration include coastal regions of South Africa, eastern Australia, and Europe. Interestingly, this animal floats upside down on the ocean surface, aided by the presence of a gas-filled sac in its stomach. Its prey generally consists of creatures larger than itself. The preferred prey of the Sea Swallow includes creatures such as the Velella and the Violet Snail. They have also been known to engage in cannibalism on occasion.